The holiday season is upon us, and your loyal year-round fans are getting ready to spend the bulk of their discretionary dollars. However, as people cut their budgets in order to save more money for tree-trimming and gift-giving, it can be tough for food truck owners and other personal service providers to attract fans who may be reluctant to spend money on themselves. Fortunately, FoodTruckr has the scoop on six seasonal strategies your food truck can use to delight fans all throughout December. These festive ideas are a fun way to connect with your customers and to entice fans with tastes and deals that are simply too good to pass up. 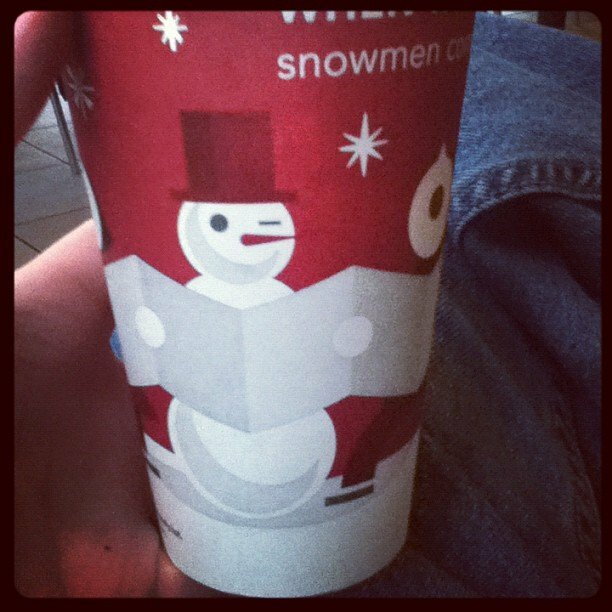 Looking to show off your holiday spirit and let customers know that you’re excited about the season? There’s no better way to get in on the holiday fun than by sprucing up your vehicle with some colorful décor. For instance, some festive battery-operated LED lights strung around the top of your truck, on your dashboard, or around your menu draws attention to your business and gets customers in the holiday spirit. 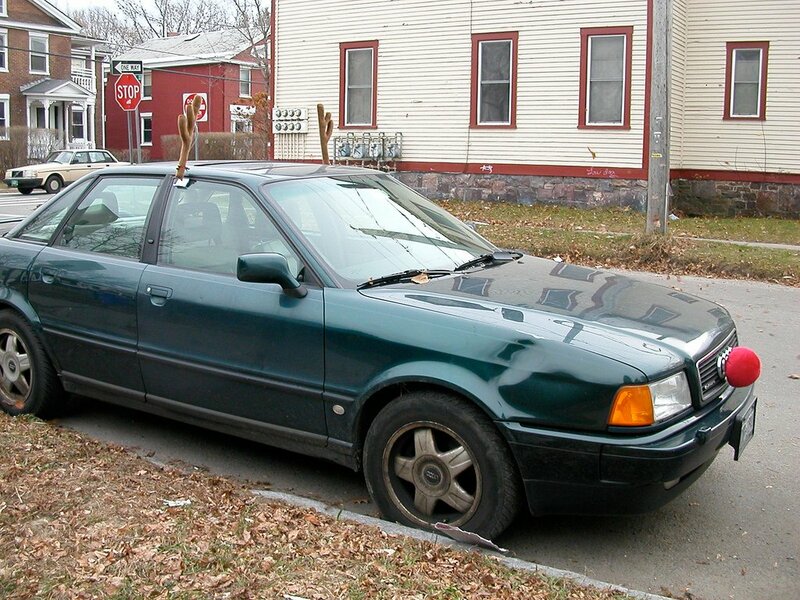 Decorations like a set of antlers and a Rudolph nose allow you to participate in the timeless tradition of seasonal cheer for the price of a burger and a large soft drink. Put a tiny tree with lights inside your truck and turn on your favorite Christmas music. Have your team dress up with Santa hats and elf ears. However you choose to decorate, keep in mind that holiday decorations on your truck show people that there could be more festive goodies waiting for them inside. Spruce up the outside of your truck and show customers that you’ve got the gift of the holiday spirit. Whether you’re hoping to attract hungry shoppers who need lunch or you want your truck to be a source of gift ideas, offer generous promotions during the holiday season. Customers are looking for great deals and stocking-stuffers in December—and you’re competing against chain restaurants like Chipotle and Olive Garden that offer special deals when customers buy holiday gift cards. Consider running a special promotion like “Buy a $25 gift card, get a $5 gift card for yourself for free.” You could also give away a free round of sliders or a complimentary burrito with the purchase of a gift card. These small incentives get people thinking about buying gift cards from your truck even though they might have otherwise only considered traditional restaurants. Suddenly, your biggest fans realize how they can share the joy of your truck with their closest friends and family members. And of course, you might even get some fans to commit to coming to your truck in the new year because they’ll buy gift cards for themselves in order to take advantage of your promotions. If you’ve been thinking about launching a loyalty or rewards program, the holidays are also a great time to get started. Then, when someone buys a gift card in December, you can offer an extra punch on his or her loyalty card to promote the program. It’s just one more way to get customers excited about visiting your truck again in the new year. Of course, the holiday season isn’t all about giving gifts—it’s also an important time to remember people in need, such as the local members of your community who are hungry or in need of a warm place to stay. As you’re highlighting promotions for your customers who want to give gifts to family and friends, be sure to also give something back to people who really need the help. 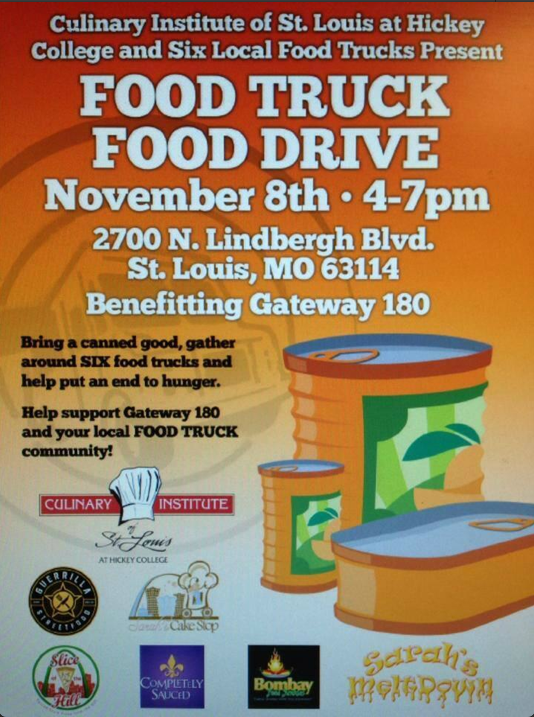 In November, the Culinary Institute of St. Louis at Hickey College and six local food trucks including Guerilla Streetfood, The Meltdown, and Slice of the Hill hosted a food truck food drive. Customers who brought a canned good received a free bottle of water with their purchase. Events like this one allow you to make a difference while also inspiring your fans to do the same. You might also consider donating a portion of your daily profits to an organization that cares for the poor in your city or giving free meals to low-income families. Your customers are hungry for the tasty delights you offer all year round—but even your most loyal fans may be easily swayed by the seasonal flavors and smells of cinnamon and spices wafting their way from other trucks down the street. Give fans a reason to visit your truck by offering special seasonal items to tantalize their taste buds. You might even attract some fans who are trying to save their money for holiday shopping but find the enticing nature of a festive goodie too much to pass by. 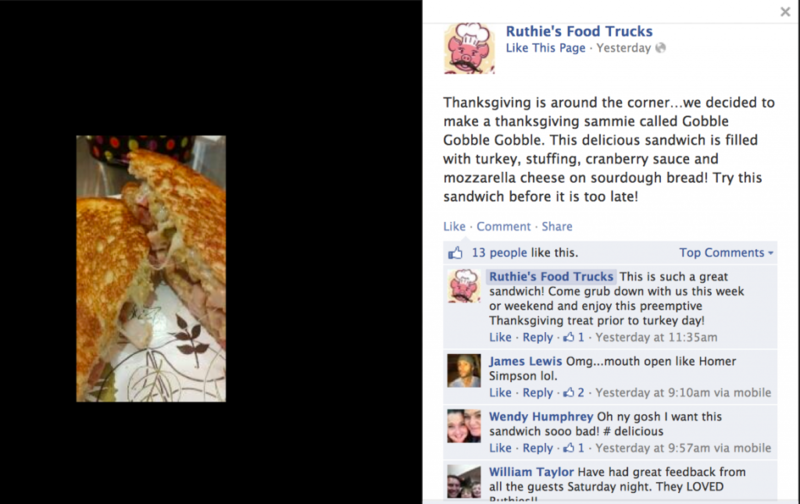 For instance, we love the incredible sandwich Ruthie’s Food Trucks put together to attract people before Thanksgiving. The Gobble Gobble Gobble included turkey, stuffing, cranberry sauce, and mozzarella cheese on sourdough bread. If you were already in the holiday spirit and you saw a Facebook post advertising this awesome menu addition, how could you resist? Naturally, you want to make it easy for fans to find you all year long—but there’s extra opportunities to reach fans during the holiday season. Take your truck to crowded areas where people will be doing lots of holiday shopping. Visit locations near popular Christmas light displays, ice skating rinks, or winter festivals. By advertising when they’ll be conveniently located near a major shopping site, Barcelona On the Go gives fans the chance to plan a lunch stop for the middle of the day. 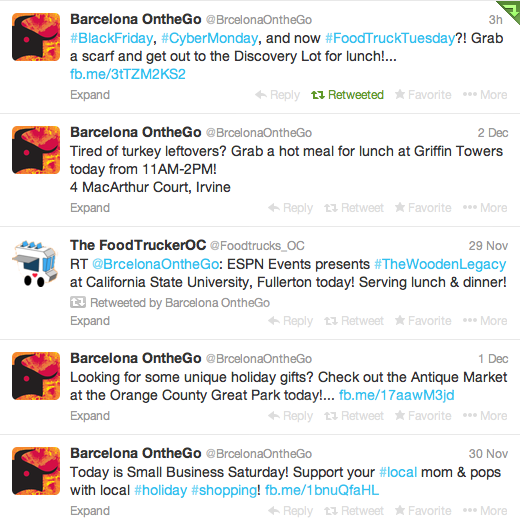 And even though people are busy during the holiday season—and less likely to check up on social media throughout the day—Barcelona On the Go can still attract scores of hungry fans who happen by their truck in a crowded spot. Figure out where your fans are most likely to be out and about during December and take your truck to them. Finally, make each fan’s experience at your truck a memorable one by adding those special small touches that transform a lunch from “delicious” to “WOW.” Think of something like the iconic holiday red cups Starbucks uses each year or the big red plastic bags with snowflakes you see at Target during the holiday season. These simple touches cater to fans who are in the spirit of the season and who are excited to see holiday reminders everywhere they go. Whether you invest in some holiday-themed cardboard containers for your dishes or tie a festive ribbon around each to-go box, a little bit of seasonal cheer makes your truck stand out in your customer’s mind. And the next time that customer heads out for a day of holiday fun and shopping, he or she will visit your truck for the small burst of celebratory cheer you have to offer. Keep things festive and fun all December-long and you’ll make the kinds of dedicated fans who will stick with you throughout the entire year. Participating in the holidays helps you stay involved with your fans and cater to their interests—and it’s a fun way to showcase your lighthearted side and to get your employees and fans into festive, cheery moods.